I can’t seem to get enough one-dish meals. 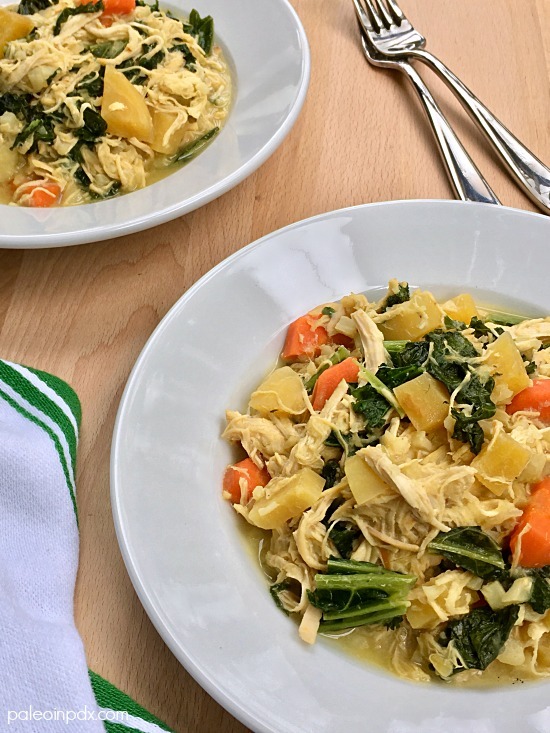 In fact, I’ve been making my slow cooker curried chicken stew on repeat (which can easily be made on the stovetop too) and while I’m still not sick of it, I wanted to mix up the flavors a bit. 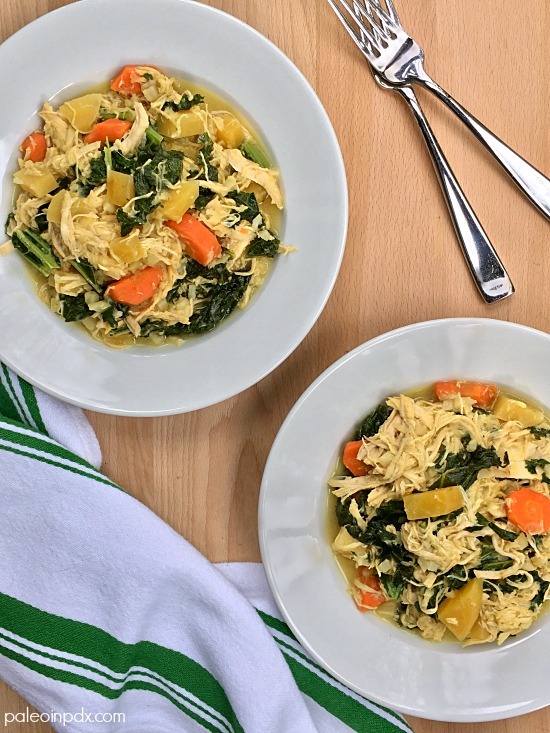 The result was this creamy chicken and vegetable stew. With an initial idea and some flavor research, this recipe came together even better than I imagined. It has a lighter, spring flair to it and is abundant in flavor. The coconut milk makes it creamy, as does the starch from the sweet potato, after it cooks down. It’s wonderfully savory and satisfying, and loaded with vegetables and shredded chicken. I admit that from an appearance standpoint, it strongly resembles my slow cooker curried chicken stew, but I assure you, it’s quite different. I also opted to make this one on the stovetop too, but it could be made in the slow cooker, if desired. Anyway, I’m gearing up to make this recipe again soon and can’t wait! Melt ghee or coconut oil in a large pot over medium heat. Add the onion and fennel, and sauté a couple minutes. Then, add the garlic and ginger, and sauté for 1-2 minutes more. Next, add the coconut milk, lemon juice, broth and sea salt. Stir well. Then, add the chicken breasts and bring to a simmer. Reduce heat to medium-low, cover (tilt lid, if needed), and continue to cook for 45-60 minutes. After 45-60 minutes, break up the chicken a bit with a wooden spoon or spatula. Then, add the beets, carrots, and sweet potato. Cover again and cook over medium-low heat for 15-20 minutes. Break up the chicken a bit more, if needed (it’ll start to break up on its own too). Then, add the cauliflower rice and kale. Stir well and add a bit more broth, if needed or desired. Cover and cook for another 3-5 minutes. Taste and adjust flavor as desired. At the store or farmers’ market, are white-fleshed sweet potatoes easily discernable from the more common, orange-fleshed variety? For instance, if their vendor has not clearly marked them as such, can you tell them apart visually? First off, not all stores carry the white variety, but you’d be better apt to find them in places like Whole Foods and other health food stores (or farmer’s markets). They have a lighter skin than the garnets or jewels and once you learn how to spot them, they’re pretty distinguishable (in my opinion). They’re also sometimes called, Hannah sweet potatoes. Japanese sweet potatoes are white inside too (with dark red/purplish skin), but have a different texture than Hannahs. Hope that helps! This looks delicious! Can’t wait to give it a go! Thanks for sharing.